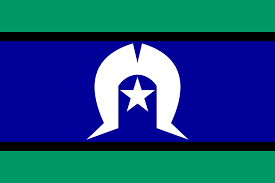 The Torres Strait Islander flag is a symbol of unity and identity for the Torres Strait Islander people, and illustrates the deep connections they have with the sea, islands and sky of the Torres Strait. The flag has two green horizontal bands, and one blue band which are separated by black lines. Within the flag is a Dhari (a ceremonial headdress), and a five-pointed star. Green: the two green sections represent the mainlands of Papua New Guinea and Australia. Blue: the blue between these two continents is the blue of the waters surrounding the Torres Strait Islands. Central white symbol: the Dhari or headdress. Dhari is the Meriam (Mer) word for 'headdress' and is predominantly used in the eastern islands. In the central and western islands, the headdress is called a Dhoeri. The headdress is worn and made by males, and their designs will change from island to island. ​Five pointed star: The five-pointed star represents the 5 major island groups of the Torres Strait and their ties to navigation by sea. The flag was chosen from over 100 entries in a design competition, organised in January 1992 by The Islands Coordinating Council. The flag was designed by the late Bernard Namok from Thursday Island. It wasn't until July 1995 that the Torres Strait Islander flag was recognised by the Australian Government as an official 'Flag of Australia' through the Flags Act 1953. Although you don't need permission to fly the Torres Strait Islander flag, you must get permission to reproduce it for commercial purposes.